Murata Electronics Europe B.V. is partnering with Samurai Incubate Inc. (Headquarters: Shinagawa, Tokyo; CEO: Kentaro Sakakibara) to host the 2nd Murata Hackathon, an event that seeks new business ideas in IoT, from September 14-15 in Israel. A hackathon, coined by combining the words “hack” and “marathon,” is an event in which engineers come together to compete in teams and give shape to ideas. Participants write programs and develop applications over the course of several days. With the world of the Internet of Things or “IoT” expanding at a rapid pace, there is demand for the birth of unprecedented and innovative products. Murata is therefore targeting the creation of new business in IoT and following last year’s event, it will host the 2nd Murata Hackathon in Israel. The event is aimed at developing new applications by integrating Murata’s state-of-the-art parts, especially sensors and communication modules, with original ideas from Israel, a country known for its software development expertise. 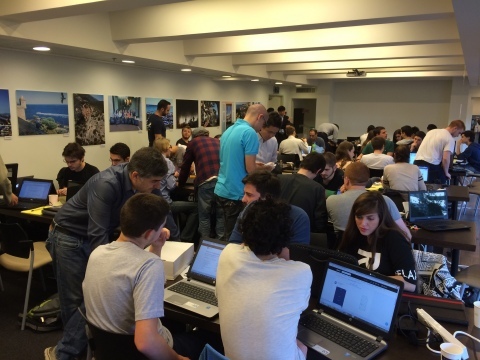 Organizer: Murata Electronics Europe B.V.
Eleven teams participated in last year’s 1st Murata Hackathon. The winner, Israeli startup The Elegant Monkeys (TEM), has entered into an agreement with Murata to pursue joint development in the healthcare sector. The Elegant Monkeys is excited to start a highly ambitious and strategic cooperation with Murata, made possible as a result of winning their 1st Israeli Hackathon last year. We believe that the combination of Japanese top-quality hardware innovation alongside the Israeli software and algorithm expertise, will lead to a new industry standard of products. Although we cannot elaborate at this time, this joint venture is a big step for the Israeli-Japanese collaboration towards global technological advancements.